Robert Leckie was an American author of books on United States military history, sports, fiction, autobiographies, and children's books. As a young man, he served in the Marine Corps with the 1st Marine Division during World War II; his service as a machine gunner and a scout in the war greatly influenced his work. The dissolution of the German, Russian, Austro-Hungarian and Ottoman empires created a number of new countries in eastern Europe and the Middle East. Some of them, such as Czechoslovakia and Poland, had substantial ethnic minorities who were sometimes not fully satisfied with the new boundaries that cut them off from fellow ethnics. For example, Czechoslovakia had Germans, Poles, Ruthenians and Ukrainians, Slovaks and Hungarians. The League of Nations sponsored various Minority Treaties in an attempt to deal with the problem, but with the decline of the League in the 1930s, these treaties became increasingly unenforceable. One consequence of the massive redrawing of borders and the political changes in the aftermath of the war was the large number of European refugees. These and the refugees of the Russian Civil War led to the creation of the Nansen passport. 132 billion gold marks ($31.5 billion, 6.6 billion pounds) were demanded from Germany in reparations, of which only 50 billion had to be paid. 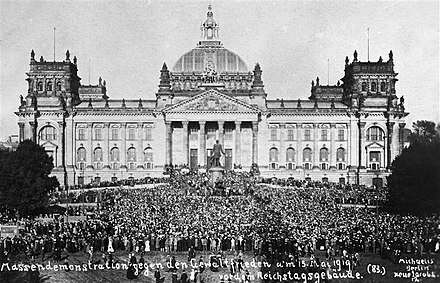 In order to finance the purchases of foreign currency required to pay off the reparations, the new German republic printed tremendous amounts of money – to disastrous effect. Hyperinflation plagued Germany between 1921 and 1923. In this period the worth of fiat Papiermarks with respect to the earlier commodity Goldmarks was reduced to one trillionth (one million millionth) of its value. 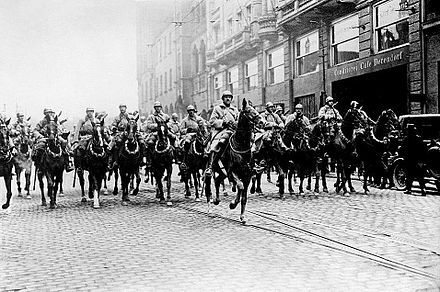 In December 1922 the Reparations Commission declared Germany in default, and on 11 January 1923 French and Belgian troops occupied the Ruhr until 1925. In Britain, funding the war had a severe economic cost. From being the world's largest overseas investor, it became one of its biggest debtors with interest payments forming around 40% of all government spending. Inflation more than doubled between 1914 and its peak in 1920, while the value of the Pound Sterling (consumer expenditure  ) fell by 61.2%. Reparations in the form of free German coal depressed local industry, precipitating the 1926 General Strike. While disillusioned by the war, it having not achieved the high ideals promised by President Woodrow Wilson, American commercial interests did finance Europe's rebuilding and reparation efforts in Germany, at least until the onset of the Great Depression. American opinion on the propriety of providing aid to Germans and Austrians was split, as evidenced by an exchange of correspondence between Edgar Gott, an executive with The Boeing Company and Charles Osner, chairman of the Committee for the Relief of Destitute Women and Children in Germany and Austria. 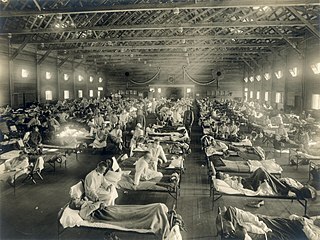 Gott argued that relief should first go to citizens of countries that had suffered at the hands of the Central Powers, while Osner made an appeal for a more universal application of humanitarian ideals. The American economic influence allowed the Great Depression to start a domino effect, pulling Europe in as well. Also extremely important in the War was the participation of French colonial troops, including the Senegalese tirailleurs , and troops from Indochina, North Africa, and Madagascar. When these soldiers returned to their homelands and continued to be treated as second class citizens, many became the nuclei of pro-independence groups. During World War I Italy aligned with the Allies, instead of joining Germany and Austria. This could happen since the alliance formally had merely defensive prerogatives, while the Central Empires were the ones who started the offensive. With the Treaty of London, Britain secretly offered Italy Trentino and Tyrol as far as Brenner, Trieste and Istria, all the Dalmatian coast except Fiume, full ownership of Albanian Valona and a protectorate over Albania, Antalya in Turkey and a share of the Turkish and German colonial empire, in exchange for Italy siding against the Central Empires[ citation needed ]. In Italy, the discontent was relevant: Irredentism (see: irredentismo ) claimed Fiume and Dalmatia as Italian lands; many felt the Country had taken part in a meaningless war without getting any serious benefits. This idea of a "mutilated victory" ( vittoria mutilata ) was the reason which led to the Impresa di Fiume ("Fiume Exploit"). On September 12, 1919, the nationalist poet Gabriele d'Annunzio led around 2,600 troops from the Royal Italian Army (the Granatieri di Sardegna), nationalists and irredentists, into a seizure of the city, forcing the withdrawal of the inter-Allied (American, British and French) occupying forces. The "mutilated victory" ( vittoria mutilata ) became an important part of Italian Fascism propaganda. ↑ Marks, Sally (1986). "1918 and After: The Postwar Era". In Martel, Gordon. The Origins of the Second World War Reconsidered. Boston: Allen & Unwin. p. 19. ISBN 0-04-940084-3. ↑ Gläser (1998). The Treaty of Versailles: A Reassessment After 75 Years. New York: Cambridge University Press. pp. 388–391. ISBN 0-521-62132-1. ↑ Marsha L. Rozenblit (2004). Reconstructing a National Identity: The Jews of Habsburg Austria During World War I. Oxford UP. p. 163. ↑ Fromkin, David (1989). A Peace to End All Peace: Creating the Modern Middle East 1914–1922. New York: H. Holt. p. 565. ISBN 0-8050-0857-8. ↑ Taylor, A. J. P. (1976). English History, 1914–1945. New York: Oxford University Press. p. 123. ISBN 0-19-821715-3. ↑ Taylor, A. J. P. (1976). English History, 1914–1945. New York: Oxford University Press. p. 122. ISBN 0-19-821715-3. ↑ Barnett, Correlli (2002). The Collapse of British Power. London: Pan. pp. 424 and 426. ISBN 0-330-49181-4. 1 2 Cable, Amanda (2007-09-15). "Condemned to be virgins: The two million women robbed by the war". Daily Mail. Retrieved May 1, 2011. 1 2 Nicholson, Virginia (2008). Singled Out: How Two Million British Women Survived Without Men After the First World War. Oxford University Press. ISBN 0-19-537822-9. Wikimedia Commons has media related to Aftermath of World War I .
London Pact, or more correctly, the Treaty of London, 1915, was a secret pact between the Triple Entente and the Kingdom of Italy. The treaty was signed in London on 26 April 1915 by the United Kingdom of Great Britain and Ireland, the French Republic, the Russian Empire, and the Kingdom of Italy. 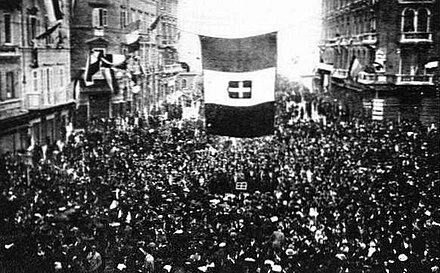 Its intent was to gain the alliance of Italy against its former allies, including the German Empire and Austria-Hungary. The main lure was promising large swaths of Austria-Hungary to the north of Italy and to the east across the Adriatic. Britain also promised funding. Italy promised to enter the war the next month. The alliance with Italy's old enemy Austria had been promoted by some politicians as a realpolitik move and had never been popular with the public. Also, the Allies could easily outbid Austria-Hungary and thereby won a military alliance with 36 million Italians. The secret provisions were published by the Bolsheviks when they came to power in Russia in late 1917. The Armistice of Mudros, concluded on 30 October 1918, ended the hostilities, at noon the next day, in the Middle Eastern theatre between the Ottoman Empire and the Allies of World War I. It was signed by the Ottoman Minister of Marine Affairs Rauf Bey and the British Admiral Somerset Arthur Gough-Calthorpe, on board HMS Agamemnon in Moudros harbor on the Greek island of Lemnos. The Diplomatic history of World War I covers the non-military interactions among the major players during World War I. For the domestic histories see Home front during World War I. For a longer-term perspective see International relations of the Great Powers (1814–1919) and Causes of World War I. For the following era see International relations (1919–1939). The major allied players included Great Britain, France, Russia, and Italy and the United States. 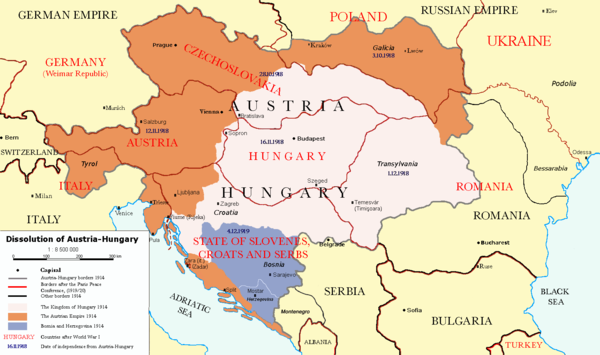 The major Central Powers included Germany and the Austria-Hungary, and the Ottoman Empire (Turkey). Other countries—and their colonies—were also involved. 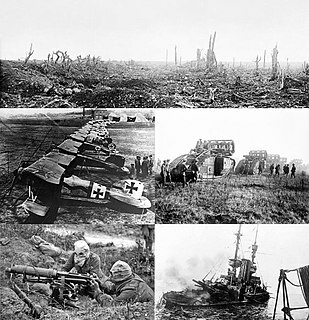 For a detailed chronology see Timeline of World War I.